I went to an interesting talk the other night at the Little Ship Club. David & Jackie Peers were talking about their experience in the Philippines when they were in the direct path of Typhoon Haiyan. Their advice – if you are in a port – get off the boat. There is very little you can do to save your boat against the forces of nature, so you are best to do as much as you can to prepare your boat for the worst conditions, but it just isn’t worth risking your life by staying on board. So that got me thinking about what one should do if a hurricane/cyclone/typhoon is forecast. What is the best way of preparing the boat? 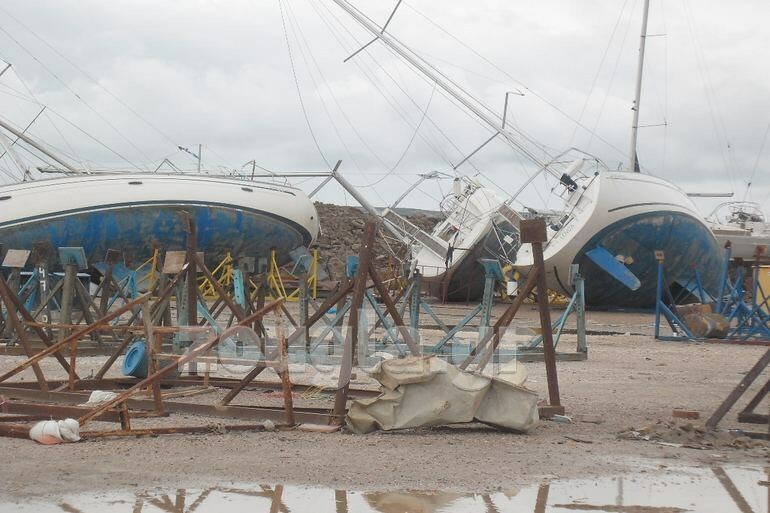 Some marinas may specify that boats have to evacuate from the marina, to avoid the boats from destroying the marina and each other. Your safe haven may not be so safe if they kick you out! If you can stay in a marina, check the piles, cleats, and piers. Are they strong enough to withstand the storm? Aim to dock your boat with the bow pointing in to the wind/waves. Check your lines, add springs, and ideally the lines should be as long as your boat. Spread the loads to other cleats and piles, your boat should end up looking like a spider in the middle of a web. Consider storm surge, will your lines cope with the higher water level? Check your neighbours. If they break loose then who are they going to smash in to? Add chafing protection to your lines and lots of fenders. If you are able to move inland up a river or canal then this could be a good option to protect you from strong waves. However what about if the river floods and debris is washed down? If you are able to find a snug hole you can use lines and chain to make a web, positioning your boat in the centre. Having chain or weights positioned on the line can counter the storm surge, and help keep your boat positioned in the centre. Use chain at the ends and strong rope on the boat, enabling you to easily adjust the lines if you are on board. Swing room and proximity to other boats. There are various anchor set-ups for storms, all will depend on the conditions and how much room you have. Options include deploying in a line or at 120 degree angles to one another. What is the holding like? Hard sand, clay and mud will hold better than shells and soft mud. Apparently boats stored ashore are supposed to be safer than those still in the water, although this is not always the case! It could be an option to consider. Consider storm surge – could the waves come ashore to the yard? Chafe protection. Lines under pressure will soon chafe through without adequate protection. Heavy canvas like used fire hoses are good options. Add thimbles to eye splices to reduce wear. Avoid overloading a single cleat, spread the loads around the boat. Reduce windage – remove biminis, sails, solar panels, life rings, the dinghy. Arrange the halyards to reduce flogging. Block up all ventilation, dorades etc. Make sure your batteries are fully charged. Have a plan in your mind and purchase the equipment required well in advance. Chandleries could be far away or sell out of essential equipment at the last minute. Act early to get everything in order and then leave the boat before the weather prevents you from doing so. Do you have any other great tips for preparing your boat for a storm (if you are in port)? We’re getting ready for cyclone season over here, so a genuine thank you for the timely reminder of what we should do and the fantastic, practical tips! 1) Get off the boat – you can repair/replace a boat, not you! 2) And far more important – and what we followed – stay out of the cyclone area in cyclone season – easy! Deal is done. There are wonderful places to cruise elsewhere. This was our philosophy and it worked for us! If you’re going to tough it out on your boat consider wearing your foul weather gear because in port, on a mooring, or at anchor, if you’re staying with the boat you’re going to get wet. Consider also wearing your scuba or snorkeling goggles to keep spray and rain out of your eyes, while you run around checking your gear during the storm. Don’t forget to eat or have snacks prepared ahead of time. Sometimes with all of the anxiety it’s easy to forget. Lastly, don’t do anything stupid in a panic like accidentally fall overboard into the water. (this happened to someone who was miraculously plucked out of the water by his wife at the helm) If you’re going forward to check for chafe, make sure you have a spotter, and tie yourself carefully to the boat. 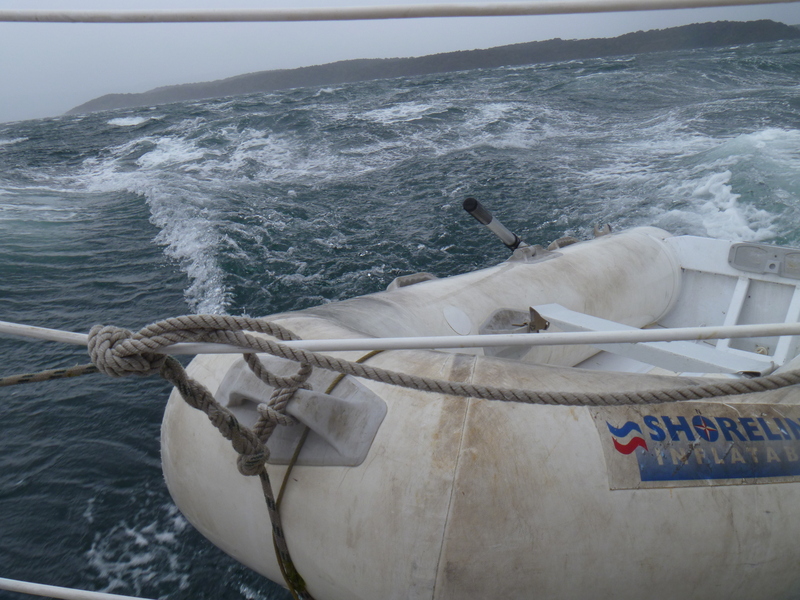 The boat can heel unexpectedly 20 degrees or greater (depending on the boat) during hefty gusts. After Odile hit Mexico’s Baja Peninsula in 2014 three cruisers died because one was trying to save their dog, and the other two tried to abandon their boat and launch their life raft. Their bodies were found in the nearby mangroves with full immersion suits on. What caused them to flee wasn’t clear, but the storm hit them in the dark. Boats at anchor can drag, and moorings can break. I’d second JakieandNoel’s advice, but also put your boat in a marina if possible but do your research, and survey their docks. Many marinas offer a safe haven for boats and some do not charge. As much as we all love our boats, your life is more important. Kiki…a good article on storm. When we had our boat on North Carolina we had it up on the hard with all sails, dodger etc off. Expensive but less the storm surge damage. In our marina we had fixed docks on pilings so storm surge was deadly…A couple of boats got holed due to the pilings & storm surge. A great suggestion. Our marina here has claimed its fair share of boats too.